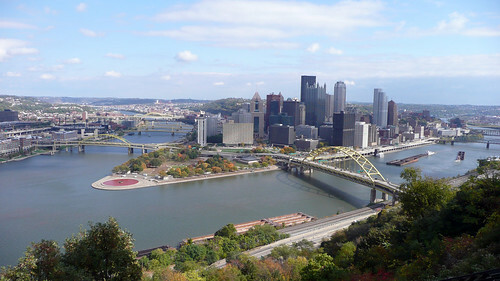 Pittsburgh Rocks! The Weakerthans! Warhol! Fallingwater! Photos! 10/30/2007 – Pittsburgh rocked! Wow, what a fun two days I had up in the Iron City and parts thereabouts. I flew up early on Saturday morning and Andy picked me up at the airport. We checked in to the hotel and made a beeline for the Duquesne Incline on the top of Mount Washington. We rode the cable cars and took in the breathtaking view of the city from the top. It was chilly, but sunny and wonderful. We grabbed some lunch at the Georgetown Inn and then headed down into the city. We went to the Carson Street South Side neighborhood and checked out the great shops, cool record stores, and Pittsburgh Guitars. What a great neighborhood, cool architecture, and hip vibe the area exuded. From there we headed north over the river, through downtown (some cool old buildings) and over the river again to the Andy Warhol Museum. This was an unexpected treat, there were so many great pieces from Warhol and others on display. I wish we had more time to study every piece. After a quick break we headed off for the main course of the trip, The Weakerthans at Mr. Smalls in Millvale. We arrived a little early and grabbed some pizza around the corner from the club and talked hockey with the guys that were working the counter. Great pizza and conversation. With a slight drizzle in the air we made our way back to Mr. Smalls just in time to see the opening act, Jim Bryson. Jim was great, he was affable and warm on stage, and the songs we’re heartfelt and sweet. He stopped to grab his harmonic for a solo (I can relate), he played piano with the headstock of his guitar, and he invited people up to play percussion. I loved it. Next up was Last Town Chorus. Megan, the singer/guitar player played a mean lap steal guitar “with an aquatic feel,” and she really made an impression on the crowd! I’d love to check them out again if they come down to Atlanta. She’s blogging the tour too, check it out HERE. OK, it was time, the opening bands had rocked and I was ready for the Weakerthans to play. They were nothing short of fantastic. They played every song that I hoped they would and more. They we’re humble and fun, and they pulled off the rock moves (synchronized guitars in the air!) with delight. I don’t think I’ve seen a band have that much fun in ages. The crowd sang along with every word, a difficult task, and requests were shouted as soon as each song ended. I cannot thank Stacey enough for turning me on to this band, but I did attempt it by getting her a t-shirt. Shhh… don’t tell her, I haven’t surprised with it yet. Too soon the show was over. I talked briefly with Jim Bryson after the show, and we decided that food was in order. We headed back down to Carson Street, where the Halloween costumes were out in full force and ordered up some big french fry sandwiches from Primanti Brothers. Wow, what a great day. Sunday we got up and out pretty early. I was going to catch an early flight home since Andy was heading back to Cleveland, but I saw the Hertz rental counter on my way into the airport and I couldn’t resist. One of the things that I wanted to do when I was up in this part of the country was to see Frank Lloyd Wright’s Fallingwater. It was about 60 miles south of town, and it was such an amazing fall day, I had to go. 90 minutes later I’m pulling up to the ticket gate, “Sorry sir, tickets are sold out today, but you can still buy a grounds pass.” Done. I registered at the information center in case anyone didn’t show up for a tour, and I was told that I’d probably get to go, “People always cancel.” She handed me one of those buzzie-light things you get at restaurants when you’re on the waiting list. Sweet. For the next hour I walked around the house, explored the area and took pictures. BUZZZZZZZ! Hurray! I scampered back to the info booth and joined a tour just as they we’re leaving. For the next hour we explored every nook and cranny of the residence, and words cannot describe what an amazing building it is. If you are ever in the area, you have to go. With the time before my flight dwindling I jumped back in the rental and high-tailed it back to the airport. I made it with 5 minutes to spare before the flight started boarding. Damn, I could have spent 5 more minutes at Fallingwater. The flight home was quick and uneventful and I nearly finished David Sedaris’ Dress Your Family in Corduroy and Denim by the time we touched down. The Weakerthans in Pittsburgh tomorrow! 10/26/2007 – I’m excited, I’m going to Pittsburgh tomorrow morning to see The Weakerthans! Know any cool places that I should check out while I’m there? Take a bite out of the audio taco!